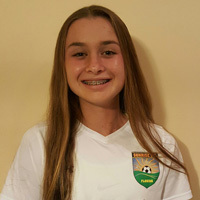 Megan is an ODP Region 3 player. She is very fast and has a nose for the goal. She is a natural left footed player but can strike with her right also. She is extremely active off the ball and applies continuous pressure to back lines. Very well suited for direct teams and teams that work hard on pressing.